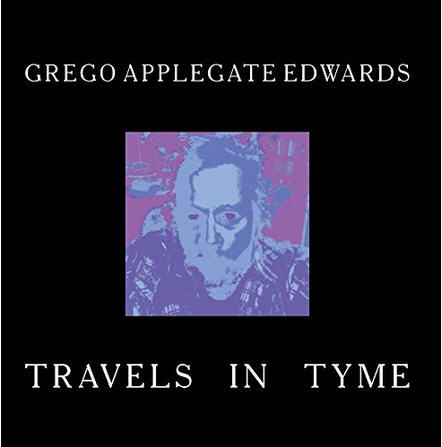 If you’ve never heard of Grego Applegate Edwards before, don’t feel too bad, he isn’t exactly a household name, and if he continues to make excellent experimental music like Travels in Tyme, I’m sure he never will be. What we have here are nine instrumental cuts that essentially defy all categorization, a difficult deed especially when almost everything one can imagine has already been done before. Compositions herein tend to be free-form mental extractions borne of varying degrees of chaos and cofusion, with fairly random rhythmic structures – nothing here one could really tap their foot to; sounds just sort of blossom with blasts of rhythm and tonal color coming at the listener from every direction, often sounding a bit like several multi-track recordings that were just randomly superimposed over one another. Among the nine cuts presented here, there isn’t a single candidate for radio play anywhere to be found. When a trace of continuity appears, either as a rhythmic structure or a melodic fragment, you can bet that it won’t last for long before it’s dissected, turned inside-out, and chopped into little pieces and reassembled in random order. Yet out of all this madness there is a chaotic beauty that, while it doesn’t adhere to the standards of song or other standard forms of music, does provoke a curious and mysterious interest that sparkles with imagination, something one could easily imbibe for hours on end. Edwards plays all the instruments here, although one might be hard pressed to identify what those instruments actually are while listening to it; guitar is a major player, though heavily processed, with random percussive elements, organ, piano, calliope, found sounds, and taped samples and loops. In some ways, this is not unlike some of the more free-form works produced by Greg Segal in recent years. These are ambient sounds custom designed for the intrepid sonic explorers among us.